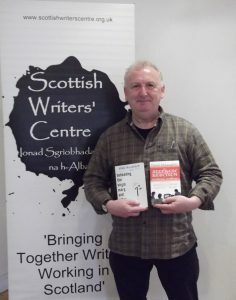 The first chapter of my novel (in progress) will be in the new edition of New Writing Scotland. The novel, with the working title Geraldine (it will!! change), is marching along as we speak. For any writer, the search for an agent is a hard one. I have recently started and have three rejections to my name to date. I feel confident that the novel To Live With What You Are will fire an agent’s imagination. Till then, I am in good company with the best of novelists facing a similar journey. So, a positive message taken in the rejection message from Rogers, Coleridge & White of London whose submissions team described the novel thus: “To Live With What You Are is intriguing and original”. Let’s hope the next time it is original, intriguing and spot on for us.